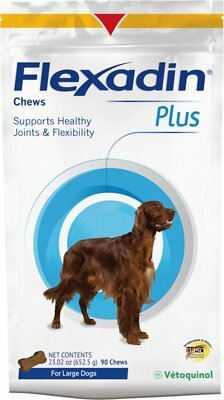 Flexadin Plus helps support healthy joints and flexibility in your pet. It contains glucosamine, perna canaliculus (a source of chondroitin), MSM, creatine, omega-3 fatty acids and vitamin E. It's highly palatable and great for administration once a day. HAZARDS TO ANIMALS: Safe use in pregnant animals or animals intended for breeding has not been proven. 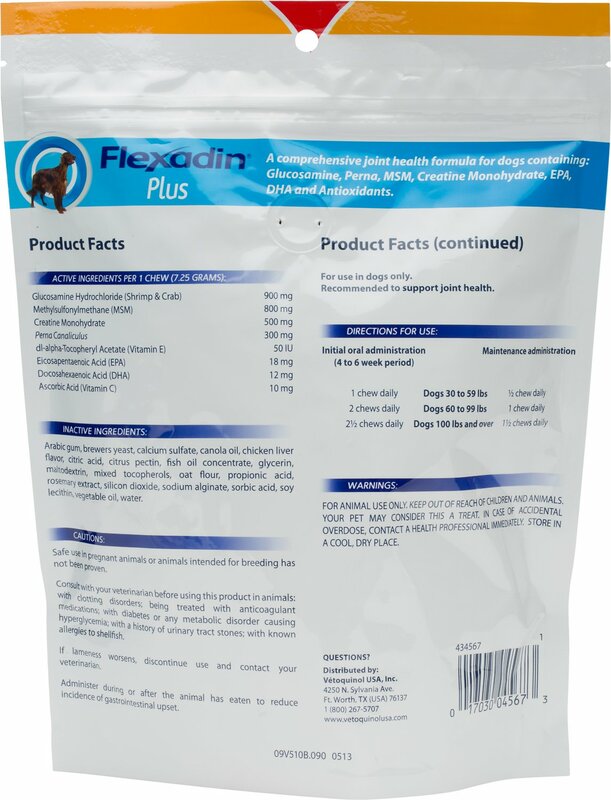 Consult with your veterinarian before using this product in animals: with clotting disorders; being treated with anticoagulant medications; with diabetes or any metabolic disorder causing hyperglycemia; with a history of urinary tract stones; with known allergies to shellfish. If lameness worsens, discontinue use and contact your veterinarian. WARNING: For animal use only. Keep out of reach of children and animals. Your pet may consider this a treat. In case of accidental overdose, contact a veterinarian immediately. Active Ingredients: Glucosamine Hydrochloride (Shrimp & Crab) 900 mg, Methylsulfonylmethane (MSM) 800 mg, Creatine Monohydrate 500 mg, Perna Canaliculus 300 mg, Dl-Alpha-Tocopheryl Acetate (Vitamin E) 50 Iu, Eicosapentaenoic Acid (EPA) 18 mg, Docosahexaenoic Acid (DHA) 12 mg, Ascorbic Acid (Vitamin C) 10 mg.
Inactive Ingredients: Arabic Gum, Brewers Yeast, Calcium Sulfate, Canola Oil, Chicken Liver Flavor, Citric Acid, Citrus Pectin, Fish Oil Concentrate, Glycerin, Maltodextrin, Mixed Tocopherols, Oat Flour, Propionic Acid, Rosemary Extract, Silicon Dioxide, Sodium Alginate, Sorbic Acid, Soy Lecithin, Vegetable Oil, Water. Administer during or after the animal has eaten to reduce incidence of gastrointestinal upset. Store in a cool dry place. I use this daily as recommended by my vet I’m not sure if it works 100% but my vet recommended it for my dog who has bad back leg arthritis. Since we started two years ago it has not gotten worse so I guess you could say it works. I continue to buy it from chewy on auto ship as it is the cheapest you’ll find. 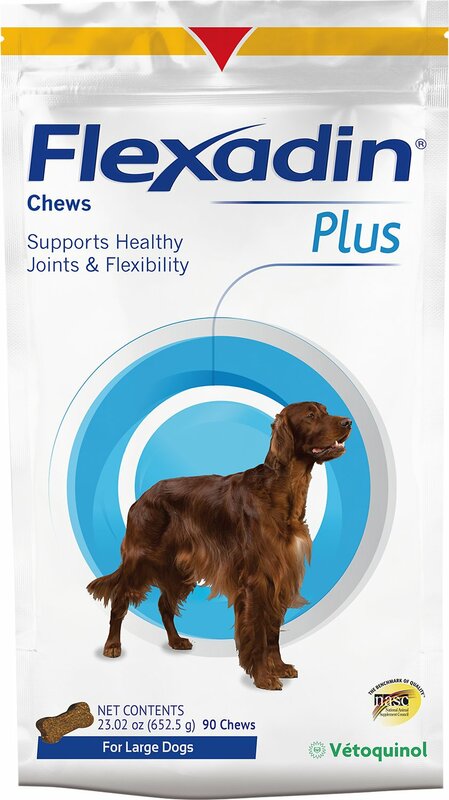 Found out our dog has hip dysplasia, and was told by our vet and even our friend a vet tech, about this brand to put our dog on. She uses it for her dog with hip dysplasia and it has helped her dog so we decided to try it out. Have not had any issues and our dog loves it! Our vet recommended this for our young dog as she has a bone anomaly in her front leg. This product keeps the joints lubricated. It works. I gave it 4 stars because we have nothing to compare it too except an RX but yes we definitely recommend it. Submitted by the Mrs.
Hard plastic containers are sometime preferable to envelopes such as this. I like this product very much, but would prefer to get it in a plastic container bottle. This envelope type delivery seems to allow the chews to be squashed. I love this product! My veterinarian is the one who recommended my dogs take this. I'm not saying," it is a bad product our dog is very picky," he refused to take them. I tried everything. Will have to try something else my VET wanted us to get these. Our Dog is a LAB!!!!!! They sound like a great supplement if the dog would take it. Careful when you order this. It’s not at all the same as original “Advanced “ formula. 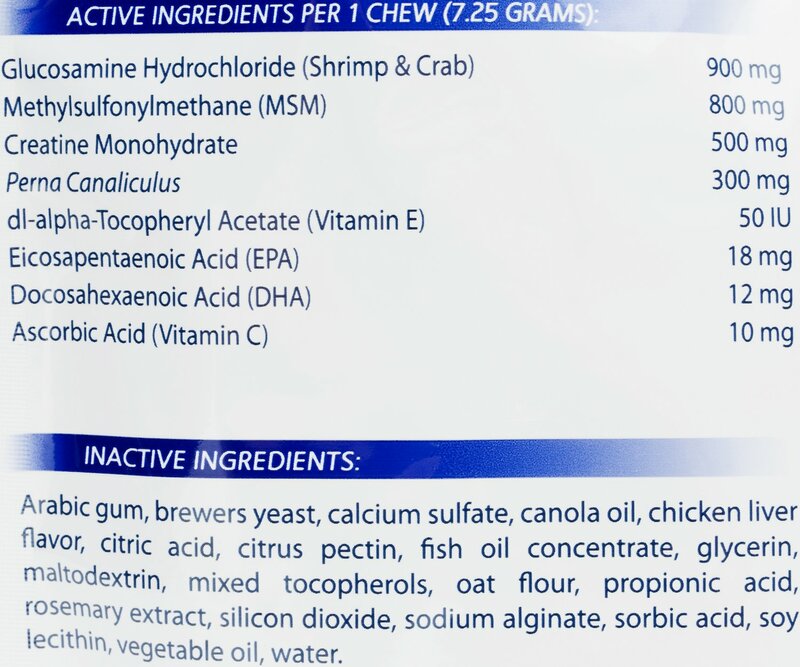 It lacks certain ingredients like collagen that my vet wants my dog to have and adds other supplements that are available in other supplements like Dasaquin that your dog may already be receiving max safe daily amt. Will have to return. My dog is picky with treats. I tried to blend it with his food and tried covering it with peanut butter. He would not eat it. It has a rather strong smell. Therefore, I can't comment on whether it helped with his joint issue. Really good to assist with joint and arthritis problems.